LAHORE: The PML-N is considering launching Maryam Nawaz’s son Junaid Safdar for its election campaign. Mr Safdar, currently a student of politics at a UK university, reached Pakistan on Monday morning. He is expected to meet his grandfather Nawaz Sharif, father retired Capt Safdar and mother, all three imprisoned at Adiyala Jail. A senior party official says whether Mr Safdar manages to visit his elders in jail or not, he is likely to address corner meetings in certain constituencies. “Though many PML-N candidates are yearning to invite Safdar in their respective campaigns, it’s being planned to arrange corner meetings in constituencies NA-127 (Lahore-V), from where his mother had planned to contest before her disqualification; NA-132 (Lahore-X), the seat where PML-N president Shahbaz Sharif is a candidate; and in NA-59 (Rawalpindi-II), where incarcerated PML-N leader Raja Qamarul Islam is fighting against former interior minister Chaudhry Nisar Ali Khan,” the official says. He says a decision on selecting more constituencies for Mr Safdar and content of his speeches will be taken after his meeting with his mother. 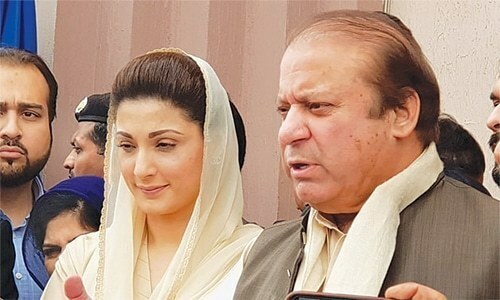 According to him, the party will release more audio and, if possible, video messages of Mr Sharif and her daughter during the party’s electioneering if the duo is denied bail in the Avenfield case. One audio message each of the two leaders has already been released through the social media. Pmln supporters most learn something from zaeem quadri. Is there yet another Bilawal in making? Dynastic politics suits the ruling class as it's the best way to fool gullible, illiterate and poorly literate sections of society. Now this 23 year old will teach politics to PMLN members who are in politics for 30+years? Nisar was right! How poor is the PML-N that in the entire country they have only one family to draw upon for leadership talent? And is such a party worthy of anyone's support. Don't they have any other leader outside the family, capable enough? Family Business not National Matter. Now he will do corruptions for next 50 years... Bad luck Pakistan. If this doesn't wake up PML-N supporters about fake-democracy and rather family kingdom; then I do not know what else will! I pray we are freed from these egoistic dynasties playing power games using everyday citizens as pawns. They have no real life experience of hardships people live through on a daily basis and are not qualified to govern a nation. People wake up, stop supporting them. Elect sincere qualified people. Can't the followers of these parties not see that they have no democracy at all? They keep bringing their children into the politics. When will these politics of emotional blackmail and manipulation will stop? These political dynasties are so power hungry that they want to keep power at all costs. Another arrogant, inexperience and highly emotional member of Sharif's family is getting ready to enter into politics and will follow footsteps of his mother and grandfather and make money through corrupt practices. All is done to save doomed dynasty! Let's see if Shahbaz and Hamza Sharif accepts the proposal. PPP is the party of Zardari not Bhuttos now and ahead! Zardari has not issued even a single ticket to loyal party members of PPP nor any Bhutto. And what quality does he have that he is being launched with no knowledge of the common man’s difficulties. With little life experiences this is a joke to keep the party in the family and fool the nation. No merit based appointments well done Pakistan. Shame om PML-N as this is family dictatorship. Learn from other countries who have successfully implemented democracy. One mistake after another. Sharif will never learn. They still think that they are a royal family and do not realise politics in Pakistan has moved on. Trying to run politics by emotions, won't work, this time atleast ! This will be last nail in the coffin of PMLN as no self respecting politician will accept it. @Shah it never ends. But people like you sit back and only criticise rather than putting themselves forward. If you want change then change yourself. Everyone is born with potential. Believe in yourself. Or prepare one in your next generation. Keeping it in the family as usual. They will need to change is name to Sharif. Those diehard PMLN supporters worrying about the danger to democracy, what are your views on this development? Finally the rift between nawaz and Shabaz is visible now. Fist thing he needs to do is adding in his name like Bilawal Bhutto Zardari. He would be Junaid Nawaz-safdar. Isn’t? Mafia is always controlled and run by one family, generation after generation. I think this is good for Pakistan politics.People might say it’s the same old family my politics. He might be 23 but he is educated and more mature than many of these so called seasoned politicians even his own granddad. I think we should back these decision to kick out these old politicians and bring young and educated people who can represent Pakistan internationally and who know the whole world perspective and can talk. I can only hope that he will not be harassed by masses at large. @Sad Affairs Like Bilawal who carrying Mom's picture every time, to show that my Mom was PM and great politician, has zero knowledge about Pakistan. Maryam son never lived in Pakistan, has zero knowledge even his neighbors. PML-N is looking for the replacement of disgraced icons. This is the height of absurdity that in Pakistan family ties are used to propel political careers instead of merit and public service record. The party name is Nawaz, so thier party leaders must be from Nawaz family. Forgod sake . Have a mercy on people of pak. We are not ghulam. @ Durrani This is sane. I was neutral, I am voting PMLN now. @Zak PTI , Another party with same old electable. study politics but work on family politics just like royal family. Why cant a seasoned politician stand in her place and drive party manifesto? After all its about driving manifesto for betterment of masses. 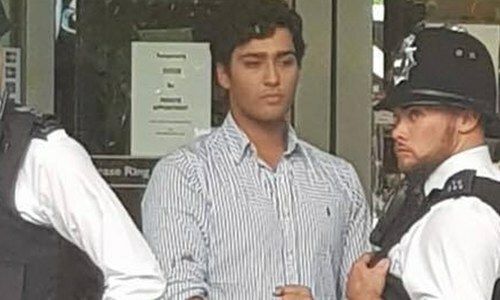 Junaid must be freed from bristish police lockup. Imran khan remains the 1st choice. Junaid grew up in London and studying thr. If still he can lead the Pmln than why not we invite british to takeover from Pak corrupt esteblishment. Please don't consider launching him. He will be arrested and no bail will be given on some charge or the other. Let him, please, enjoy his freedom. This is not democracy, this is a kingdom mentality where generation of indivduals become rulers. What a joke! 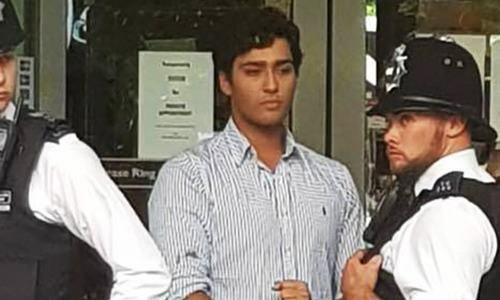 If mom, dad, uncle and grandfather are corrupt where mom and dad have been jailed what do we expect of Mr. Junaid? Family dynasty reaching the third generation now! How can people even think of supporting such a monarchy in democracy? Yes like Pakistan is their estate who they like they would install. They are just more than shameless. Authorities has left PLMn with no choice as they are putting all leaders and supporters in the jail on flimsy ground. @ Black & White pls dont lie only few electables mostly are new faces. For what Mariam son launching, this is not Kingdom, Grand father, father, mother convicted in wrong doing in London flats, what Junaid teenager will do ? Pakistani need money trail and finish this case, no money trail stay in jail, no more looting. And they talk about democracy. How ironic! Hierarchy politics in its 3rd generation is clearly a kingship. Yes, running a nation is a family business. I will vote for him and any person Nawaz sharif chooses, because he is a true leader. Why convicted criminals like Nawaz Shareef and Maryam are allowed to smuggle recorded messages out of prison.They have robbed the nation of billions of dollars and do not deserve any leniency.Who has provided them with recording devices. This fellow was arrested in UK recently. He will soon be arrested in Pakistan too. They all will be in Adyala jail in a few months. again? son, daughter then son in law then daughter then son. Is he a Pakistani or British Citizen? Shameless people! They think it's their right to plunder Pakistan. Don't want to give anybody else a chance. It's really a shame that we call Pakistan a democratic country; from top to bottom from elected officials to burocrates, too technocrates, the secretarts and tell agencys all are undomcratic with near to zero transparency, to be fair Judges are mostly doing the check and balance these days and the worst thing is they depend on enforment agency's for there order execution and even for there own security I truly feel they do more then required by current laws. But that is not the right way.. the elected body should be held accountable... And here is the word accountability and transparacy.. till then the clouds over Pakistan will be grey.. They not bother about country. They only worry to save their empire. Just imagine a country of 22 crores and a nuclear power is being run by Bilawal or Junaid. Is this our future? @AMJAD KHAN "Why convicted criminals like Nawaz Shareef and Maryam are allowed to smuggle recorded messages out of prison" most probably prerecorded. @Syed ji They don't trust anyone else. @ Black & White But with a good honest leader, this time. It remains in the family and it remains in the traditional vote banks. PMLN not heeding to the present change of mindset among voters in Pakistan to make basic changes in "heir to the throne" within the party ranks. Thereby; diminishing any increase in party popularity. Pakistanis politicians treat pakistan like their business. Keep it in the family. @Talat "The family is corrupt to the core yet the stupidity of the electorate will still give the greedy corrupt their votes" They are not stupid, on the contrary. They'll keep on voting stupids until the "intelligent" class produces someone credible. it's the "intelligent" class that has brought these people forward, not the "stupid" one. It is not the electorate who is praising these corrupt families, day in day out, but the "intellectuals". These "intellectual" are not from the electorate, they are all from the elite. PML- N has nothing to do with the well being or advancement of the country/citizen but the Sherrif family's Inc's advancement only! Feel sorry for Shahbaz Sharif. People are sick and tired of family clans!